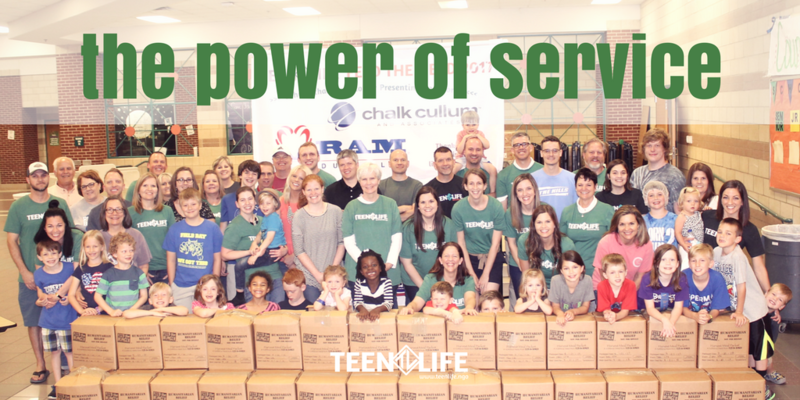 This past Friday night, we hosted a packing party at the Birdville High School cafeteria. It was an amazing event that is also a fundraiser for Teen Life to keep offering our programs in the schools. For this event, we asked people to reach out to friends and family to sponsor them to come and serve by packing 10,000 meals for hungry kids in our area. This went over extremely well. It was so exciting to see everyone come together to fill bags with rice and nutrients that families without food can benefit from. We were able to capture a time-lapse video of the event that you can watch below! As I put the clips together, watching the hustle and bustle that was going on and thinking about how much effort and dedication went into making this happen, I was blown away at how it all worked together. I am writing this blog as much for me, and us as an organization, as I am to share with you. I believe there are some valuable principles that can be seen from an event like this. In the past, we have hosted a 5K Run/Walk. The benefits of this have been amazing. People were exercising, accomplishing a goal, being outdoors. All of these benefits helped anyone that came feel better about themselves and doing it with others helped build a stong bond. So I am not arguing that this service focused event is better, but it is different and I would recommend it if you are hoping to help people connected to your organization experience some of these benefits. There is power in numbers. We packed 10,000 meals with around 70 people and that means over 1,600 families will receive a bag of food with 6 servings in it. These numbers are great! I am so glad that we could be a small part of providing something meaningful. It’s not about the recognition. The people that served and the ones that will receive the meals will likely never meet, and that’s exciting to me. The fact that people would put in 3 hours of work for people they don’t know and probably never will says a lot about the human race. We care for each other even from a distance. Modeling has huge benefits! We had around 20 elementary age kids show up to help pack meals. They were able to scoop the food, weigh it, carry it to the boxes and even tape the box. This is a big deal because it gave them the opportunity to know that the work they do is valuable. These kids packed over 600 meals with just a little help from parents. It was amazing to watch the joy they had working hard to get the job done. We had some “firsts” at this event. It was the first time we were at a local school. It was the first time we had a current student join us. It was the first time we had an alumni from one of our groups join us. It was the first time over $50,000 was raised! These partnerships, extended relationships, increased funds, and more exposure all mean that Teen Life has more opportunities to reach teenagers and change lives. It was a process planning this event and it is hard to believe it is already over. Thinking through all of these things gets me excited about what next year could hold. What is an event you have attended and noticed details that help you live better? Share them with us, we always love learning from you.